“He has sent me to bind up the brokenhearted, to proclaim freedom for the captives and release from darkness for the prisoners…to comfort all who mourn, and provide for those who grieve in Zion—to bestow on them a crown of beauty instead of ashes, the oil of gladness instead of mourning, and a garment of praise instead of a spirit of despair,” (Isaiah 61:1-4 NIV). We all know the story of Cinderella. She went from being held captive in the furnace to being a captivating belle of the ball, from being covered with ashes to being crowned with jewels, from being abused by her wicked stepfamily to being adored by her entire village. We all love “and they lived happily ever after” endings. In 2 Samuel 13, there is a story that somewhat reminds me of Cinderella’s, but with two major differences: it is no fairy tale and the events occur in reverse. It is the story of Tamar, the lovely princess daughter of King David. Tamar was one of the most beautiful young ladies in the entire kingdom. Her name meant “palm tree,” a symbol of victory and honor. She had several siblings: sisters, brothers, half-brothers, and half-sisters. It was a royal blended mess. One of her half brothers, Amnon, lusted after his beautiful half-sister to the point he couldn’t sleep at night. At the advice of a wicked friend, Amnon plotted to lure Tamar into his bedroom with the help of their unsuspecting father. Amnon pretended to be sick and requested some of Tamar’s special baked bread. He also requested that she feed it to him with her own hands. Tamar obeyed her father’s request to tend to her brother. After she entered his bedroom, the supposed sickly Amnon commanded the servants to leave the room and lock the door behind them. He grabbed Tamar, threw her on his bed, and even though she begged and pleaded for him to stop, he stole her most treasured possession, her virginity. After he had his way with her and his lust was satisfied, Amnon tossed Tamar on the floor along with her hopes and dreams. And even though Tamar was still a royal princess, she spent the rest of her days secluded in a darkened room, wearing sackcloth as if in mourning and placing ashes on her head in shame. Never again did she place the royal robe, which was rightfully hers, on her shoulders or live as the princess she truly was. She lived the rest of her life believing she could never be restored. This is not just the story of Tamar, but the story of many women I meet everyday—hiding because of shame, feeling ugly and unworthy to accomplish God’s dreams. Paul reminds us that when we come to Christ, He makes us a new creation (2 Corinthians 5:17), but many conceal or cover up that beauty with shame from past mistakes or abuse. It is as if they rise each morning and put a fresh dusting of ashes on their souls; the very ashes that Jesus came to wash away. And dear sister, it is Satan who keeps the supply of ashes coming and Satan who holds the box of ashes in his hand with the lid open ready for us to use. Oh, we may not be walking around with ashes on our heads or dressed in burlap sacks, but we wear the mantle of shame that Satan has placed on our shoulders and secures with guilt-ridden deception and lies. Please don’t let Satan deceive you into believing that you are anything less than a beautiful princess. Do not allow him to convince you your dignity cannot be restored. The truth is, it already has been. We simply need to start believing the truth. “He has sent me to bind up the brokenhearted, to proclaim freedom for the captives and release from darkness for the prisoners…to comfort all who mourn, and provide for those who grieve in Zion—to bestow on them a crown of beauty instead of ashes, the oil of gladness instead of mourning, and a garment of praise instead of a spirit of despair,” (Isaiah 61:1-4). Jesus has the glass slipper in His hand. He’s waiting for the princess to offer her foot–your foot. Don’t let Satan tell you it doesn’t fit. The One who made your foot has already decreed that it does. And they lived happily ever after. Dear Lord, I know that is the way the story of my life will end. I’ve read the book. I’ll live in eternity with the Prince. Forgive me when I sit in shame and forget what Jesus has done for me. Today, I will walk clothed in the mantle of righteousness that Jesus purchased just for me. I’ve told you the story of Tamar, but I’d like for you to go back and read it for yourself. You can find it in 2 Samuel 13. Tamar’s father didn’t do anything to help her get over her shame and come out of hiding. Your Father did. Describe, in your own words, just what God did to restore your crown. 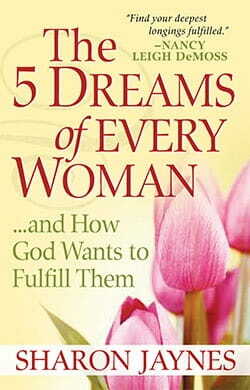 Today’s devotion was taken from my book, 5 Dreams of Every Woman and How God Wants to Fulfill Them. This book is for every woman whose life hasn’t turned out like she dreamed it would…and I think that includes most of us. Can you risk the hope that God still has dreams for your life? That He hasn’t forgotten you? Place your hand firmly in His—take a deep breath and begin the exciting journey to a place you thought you’d never find: the dream God planned for you all along. Let’s dare to dream again! Visit my website and sign up for my blog, and I’ll email you a link to download my new beautiful adult coloring book journal for free!